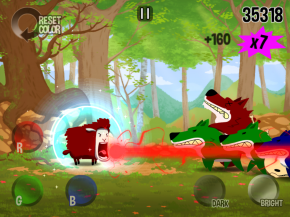 Color Sheep, Trinket Studios Inc. This is an ideal mobile game recently released on Android and iOS. 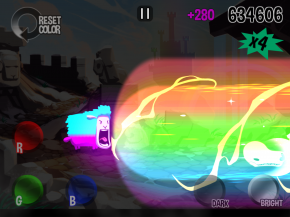 Color Sheep delivers a whole lot of bang for only a buck. 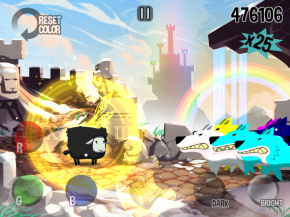 You play Sir Woolson the color changing sheep who must beat back an onslaught of colorful marauding wolves by mixing red, green, and blue in 20 color combinations. There’s also some items and level changes thrown in for seasoning. Learning the controls takes only a few seconds, but mixing the colors before the wolves eat you proves a growing challenge of memory and dexterity. The menu and buttons are exceptionally well organized making play and navigation a breeze. The graphics and sound are brilliantly put together giving the game a lighthearted and comical feel that brings a regular grin. All in all, Color Sheep entertains while it challenges your mind, not your patience. Making it perfect for mobile gaming sessions like waiting in line at the DMV, when you could really use a smile and a brain boost. Only a 27 second investment on the trailer, as value packed as the game itself.